There’s an old saying that “an ounce of prevention is worth a pound of cure”. This is especially true with our pets. Sick animals are often more difficult to treat than humans, and can be quite expensive as well. Animal immune systems are not as strong as ours, leaving them susceptible to several nasty life threatening afflictions. Vaccines can safely imitate the presence of a disease in the body, ensuring that its immune system will be ready to fight off the actual infection later in life. Vaccines are a great way to help prevent many issues, but they’ve also become the source of much debate. Much of the debate revolves around how often your pets should get boosters for their vaccinations. Unfortunately there is no clear answer to that question as of yet. Since every pet has its own unique situation, it’s best to discuss the options with your vets so that they can come up with the best plan for your pet’s health. The Australian Veterinary Association (AVA) recommends vaccinating your pet against many diseases. 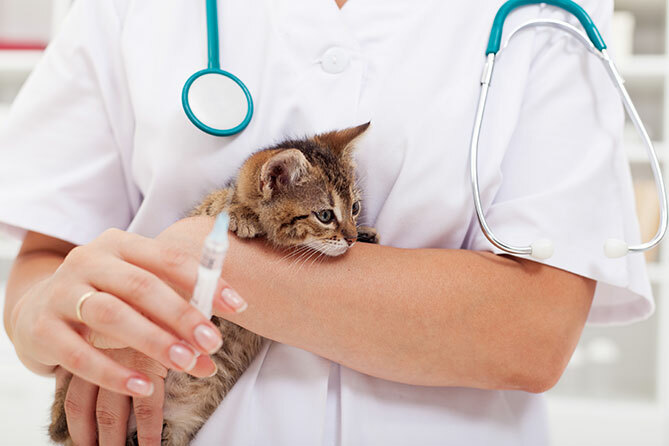 Here are some of the most common vaccines for cats. Feline enteritis is possibly the most dangerous virus for our cats. It’s highly contagious and very deadly. Pregnant cats who survive may still give birth, but the kittens can still have birth defects. Even if your cat survives, it may still carry the virus to other cats. Your cat is most vulnerable to enteritis during its first year of life. Cat flu is usually non-lethal, but is not an enjoyable experience for your cat. The symptoms are similar to human flu and can last for weeks on end. When suffering from the flu, your cat is more susceptible to other afflictions because of its weakened immune system. Much like leukaemia in humans, this affliction attacks the immune system. Your cat may show no symptoms for years and then suddenly catch an infection and become very sick. They can also develop cancerous treatments. Around a third of cats who are infected stay chronically infected, even after treatment, and can spread the infection to other cats. Other possible dangerous diseases include feline AIDS and chlamydia. Parvovirus is spread through feces. Dogs can get it on their feet, on their noses after sniffing, and in their hair. It’s a hearty virus that survives for a long time, and for that reason it can be particularly troublesome. Parvovirus can cause death within 24 hours of observable symptoms, and some puppies may die without showing any symptoms at all. Symptoms include depression, vomiting, and diarrhea with blood. Distemper is an extremely contagious infection that can damage the respiratory, gastrointestinal, and nervous systems. Vaccination is the only reliable way to prevent distemper. There are treatment options after the dog has already contracted the disease, but those treatments are not reliable, and even if your dog survives, there is a good chance that it will be left with brain damage. Luckily, few dogs fall ill from this one, but it is still deadly all the same. Hepatitis is especially dangerous to puppies and older dogs. Symptoms include elevated fever, pain in the abdomen, and uncontrollable thirst. It can also cause severe liver damage. Even if a dog survives and recovers, they can remain a carrier for a long time after. This is a leading cause of the infamous ‘kennel cough’. It attacks the respiratory system and is very contagious. Bordetella is unlikely to kill your dog, but it is still very uncomfortable and can cause a lot of distress to your pet and family. Vaccinating early is usually the best option. Females are especially more prone to certain ailments after they’ve had their first cycle. Ideally, cats should get their first general vaccines at around 8 weeks, while with dogs it could be as early as 6 weeks. For both species, boosters at a regular schedule during the first year are necessary to maintain immunity. These early days vaccines are usually the ‘core’ vaccines. They are vaccines that every dog and cat must get, and would protect against distemper and parvovirus in dogs and enteritis in cats. ‘Non-core’ vaccines are not always administered for a variety of reasons, depending on the animal. Sometimes there is little risk of your pet contracting the disease, because they rarely leave the house or you may consider the possible risks, no matter how low they are, to not be worth the benefit. These could include diseases like bordetella for dogs and chlamydia for cats. After those initial shots, there is a debate as to how often your pets should get booster shots. You can read more about that here.